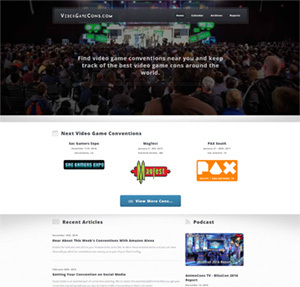 VideoGameCons.com, a site focused exclusively on video gaming conventions, has launched after completing a complete top-to-bottom redesign. In addition to a new mobile-responsive look, the back-end of the site has been completely re-written and updated. The site shares the same database as FanCons.com. FanCons.com will display all conventions, but VideoGameCons.com only displays conventions focused on video gaming and video game programming. Although many conventions have some kind of video gaming, particularly anime conventions, the conventions listed on VideoGameCons.com list video gaming as one of the primary focuses of their convention. The home page of VideoGameCons.com lists the three next conventions that have a primary focus on video games. This would include well known video gamer conventions like E3, PAX, and RTX. The Calendar section is where the meat of the site is. It has a list of future conventions worldwide, but users can view previous years or specific regions as well. A map feature lets users browse conventions plotted out on a map. The Archives section lists news and articles related to conventions. They're sorted into "News", "Articles", and "Blog Posts" categories. The Reports section lists convention reports from third-party sites. If you've written up a report on a video gaming convention, you can submit it here and it will be listed in this section and on the information page for that con. Additional new features are on the way, but the site should already prove to be a valuable resource for fans of video games and organizers of video gaming conventions. If your video game convention is not yet on VideoGameCons.com, you can submit it for approval. Listing your con on VideoGameCons.com will also get it listed on FanCons.com since they share the same database. Patrick Delahanty is the creator of FanCons.com, VideoGameCons.com, and executive producer of AnimeCons TV. He is the host of The Chibi Project, Anime Unscripted, and is one of the founders of both Anime Boston and Providence Anime Conference. Patrick has attended over 150 conventions, cosplaying at most of them.